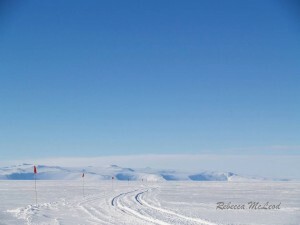 The summer season is about to get underway at Scott Base, Antarctica – if all went to plan, the first flight carrying base and field staff left earlier today. Scientists will follow in the coming weeks. This time last year I was counting down the days until I left for the ice with a group of scientists from Otago University and the States. One of the things that blew me away about doing science in Antarctica was the massive logistic operation undertaken by Antarctica New Zealand. Every year they undertake to get everyone down there (and back of course), keep them fed and warm and happy AND make it easy and safe to do science. This was a field trip like no other. We got to the Antarctic Centre in Christchurch the day before our flight and set about getting assigned all of our clothing and supplies. Antarctic New Zealand has an incredible collection of gear that they fit you out in before you get onboard — you could turn up in Christchurch in your shorts and flip-flops and it wouldn’t be a problem. 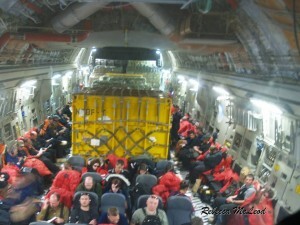 We had to don full Antarctic kit before getting on the plane, despite the temperature being well into the twenties. It was difficult to believe that 5 hours time we would be getting off the plane and walking onto a frozen sea. 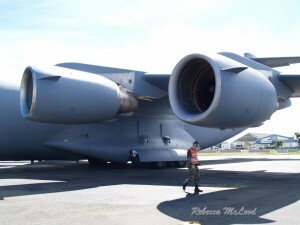 Excitement caused time to slow, but eventually the time came for us to get aboard the C17 Globemaster, strap ourselves in, and put on our earmuffs. Just being inside one of these huge planes was a new experience for me. It was a noisy and incredibly long 5 hours, and most people passed the time on their laptops, or snoozing. I spent my time mostly staring out of a tiny window. 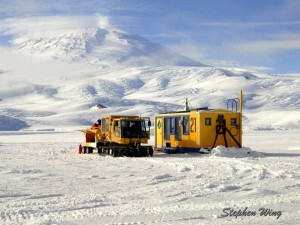 Scott Base is an incredible place, run by a truly remarkable group of people. And life there is strangely normal. It wasn’t long before I found myself looking at the thermometer on the wall and saying ’ohhh lovely, it’s minus 18 today!’. And a typical night in the lab would end with a 2 am visit to the lounge where I would sip a cup of tea and gaze out at the sun low over the mountains in the distance. Before we could get out there and get stuck into our work, we had to do a field training course. 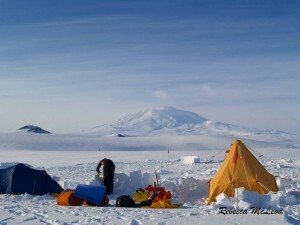 This was where we were taken out for a night of camping and training about how to keep warm, keep fed, keep sheltered, keep from falling through the sea ice, keep smiling, and for us women, how to wee standing up… ahhh the wonders of modern technology. Being from Dunedin, I thought I was well acclimatized to cold. It wasn’t until I went to take out my contacts and the solution was frozen, then went to put on some solid chap stick, and crunch on a few sultanas, that it really started to dawn on me. It was seriously cold. Beyond the limits of my imagination. The thing is though, it never really felt that cold, because the clothing and sleeping bags we had been given were just so good. Following the field course, we were ready to start preparing for our fieldwork. Our requirements were a little unusual in that we had a dive team with us, and we wanted to dive at five different sites. Underneath 2-3 metres of sea ice… But even that proved to be no problem for the logistics and field team. We were given a vehicle, loads of gear, directions to our first dive hut, and a pile of chocolate that my dreams are made of. And off we went. At each dive site a stonking little diesel fire inside the dive hut made it seriously cozy. In the floor of the hut was a hole that had been melted through the 3 metres of ice. A beautiful icy blue emanated from the hole and the water was so clear that you could see the animals on the seafloor 15 metres below. Diving underneath sea ice obviously has its challenges. Firstly, to state the obvious, it’s bloody freezing! The water is a pretty constant -1.8°C, which is about as cold as seawater can get before it starts to freeze. Divers wear thermal undergarments, and then have dry-suit on top — so only your lips are exposed to the water, and once they are numb, they don’t hurt a bit… until you get out and they start to thaw that is. 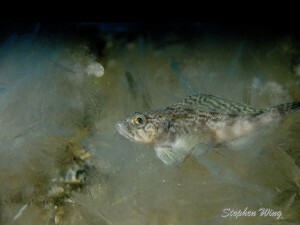 The cold water also leads to ice building up around the connection between the tank and the regulators and this can cause the air to ’free-flow’ out of the mouth piece. So an extra set of regulators is attached to the tank as a backup in case that happens. The second thing to consider is that you have a ceiling of ice overhead, and the only way out is through the hole where you came in. As a precaution, each diver is tied to a rope, and the other end is manned by a support person in the hut. 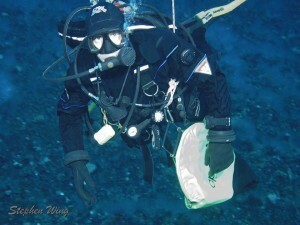 The idea is that divers can communicate with the surface by a series of pulls on the rope… although in reality, the rope tends to ger caught around the ladder and things on the bottom, and whipped around in the current, and be nothing more than a comfort to the diver that should they get into trouble our backup diver would know where to find them (being at the end of the rope…). Our mission was to collect a range of different animals from coastal habitats, upon which I would spend the next many months performing chemical analyses. I am getting close to done with that (finally! ), but that is a story for another time. 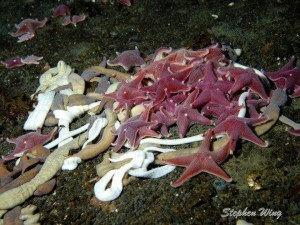 Over the years there has been a fair bit of marine research carried out in the Ross Sea, with a focus being on what animals live there and how on Earth they manage to cope with living in an incredibly cold, and for much of the year, an incredibly dark place. It is only in the past few years that the science has begun to include projects that question how whole communities of these animals function — where does all the food come from?, who eats who?, how much do animals move around in their lifetime?, and so on. Of course, with the global climate changing so rapidly, the race is on for us to understand these kinds of interactions better so that we might begin to predict how things might change in a warming Ross Sea. 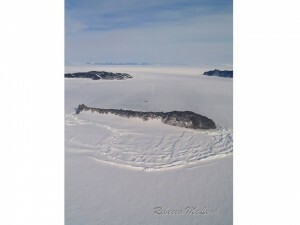 Sea ice surrounds Razorback Island. You can just see our dive site above the island. Life on top of the ice is a pretty black and white kind of world… unlike at the edge of the ice, it isn’t often that you see many signs of life on the southern end of Ross Island in the spring. 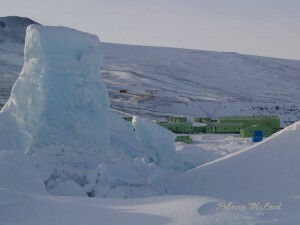 But just underneath all of that ice, is a booming community of huge biomass and amazing colour. 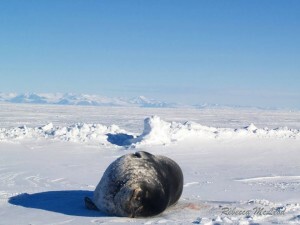 The animals are incredibly well-adapted to a life surrounded by ice. These fish have anti-freeze compounds in their blood. A typical day of work included 3 dives to collect the animals, and then we would take them (and the tired hungry divers) back to Scott Base. 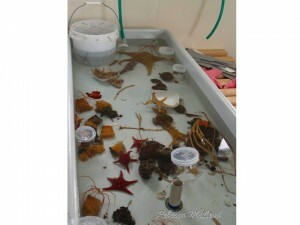 The divers would head off to get fed and warmed, and we would begin work in the lab. 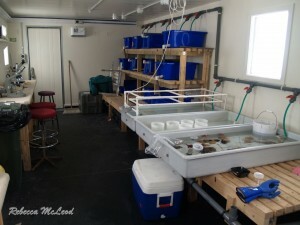 The lab set up was perfect for the kind of work we were doing — there is an excellent system of tanks that have running seawater pumped up from under the ice. 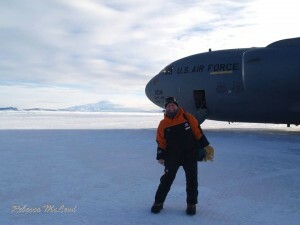 That’s all for now – I hope to bring you research stories from Antarctica as the season progresses.